The Bureau of Land Management (BLM) has temporarily closed more than 4,000 acres of public land in Whitewater Canyon to help protect its valued landscape from potential wildfires. “A wildfire under the current hazardous conditions could pose a serious threat to the public and resources, as well as adjacent private lands and communities,” said BLM Field Manager John Kalish. Severe conditions brought on by hot, dry weather; hazardous fuels and the restricted nature of this canyon make this closure necessary, says Kalish. This order will remain in effect until fire conditions warrant a lifting of the closure. 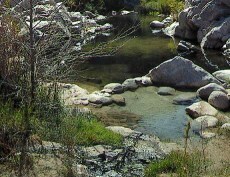 The Whitewater Preserve operated by the Wildlands Conservancy remains open, however, and can be accessed via Whitewater Canyon Road. Residents, owners, lessees, and Pacific Crest Trail hikers are exempted as long as they are in compliance with all other applicable fire restrictions and orders. All other travel on Whitewater Canyon Road is prohibited, including river access. and is posted at the entrance to Whitewater Canyon. The order specifies users of the canyon who are exempted from the closure. The closure will remain in effect for the remainder of the wildfire season. For other questions, please call the Palm Springs-South Coast Field Office, (760) 833-7100. Kalish also reminds homeowners to “Take Responsibility” and keep 100 feet of clean, open space around their homes to provide defensible space and improve the chance that their homes and families can be protected in an uncontrolled wildfire. Additional information is available at the California Fire Alliance website at http://takeresponsibility.cafirealliance.com.